Snorkelling in Fernando de Noronha. Fernando de Noronha is Diver's Mecca. Explore you snorkelling and diving Program options before you go. The pristine waters of Fernando de Noronha, with visibility of around 30 – 40 m ( 98 - 131 ft), means that enjoyment of the beautiful marine life is not limited only to diving but to snorkeling as well. It is no wonder then that snorkeling has been declared as one of the country’s 9 main tourism categories by EMBRATUR, Brazil’s official tourism advocacy group.While masks, snorkels and fins can easily be rented by those who wish to explore by themselves, it is probably better to participate in guided tours offered by operators who know exactly which are the most suitable areas for this activity. The months of August to December provide the calmest waters, suitable for good snorkeling and for those who are not necessarily excellent swimmers. Natural pools formed at low tide offer good opportunities to see marine life up close. At Praia do Sancho, considered by many as the most beautiful beach in Brazil, the sandy sea floor allows for boats to stop, without the worry of damaging the coral. This beach can be reached by sea or on foot, by a ladder that runs down from a crack in the rock formation or by walking across other beaches to get here. Other good snorkeling points are Baia dos Porcos, Sueste and Morro de Fora, between Conceição and Meio. To observe a shipwreck while snorkeling, a good option is at Porto beach where 2 shipwrecks house many marine creatures. 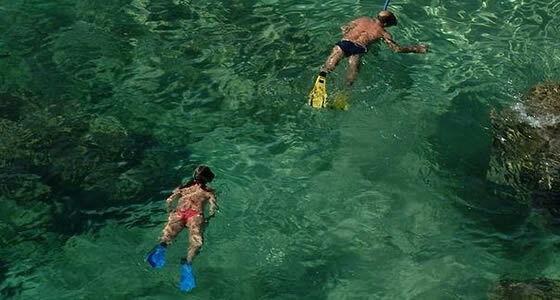 At several snorkeling points, there are restrictions on the number of people that are allowed to snorkel per day. For example, snorkeling at the tide pool of Praia da Atalaia is limited to 100 people per day due to environmental concerns. It is thus a good idea to arrive as early as possible to be able to gain entry to this pool which though only 18-24 inches in depth, displays quite a diversity of marine life, from various schools of fish to lobsters and octopuses and if lucky, even a baby shark. Carefully monitored by government officials, visitors will not be allowed to wear sun block due to concerns about chemicals contaminating the fragile ecosystems. People will only be allowed 25 minutes per person and could be fined if the rules, such as being allowed to stand in certain areas of the pool only are not adhered to.